Who doesn’t want to lose a few extra pounds? You want a simple-to-use fat buster, right? Pu.erh is a tea that’s helps people lose weight and boosts energy levels. I drank a cup of this tea on a leg workout day, which is the hardest for me, and it didn’t feel nearly as strenuous. The plyometric jumps actually seemed easy. To test this out again on a different day, I skipped my typical carb and protein shake, drank the tea with 16 oz. of water and completed one hour of cardio with no difficulty. I wasn’t even hungry or dizzy. I’m impressed! Like green tea, this also has caffeine. The truth is that caffeine only delivers minimal weight loss. Bummer! If I can exercise with more intensity and for a longer period of time, then weight loss will be amplified. Caffeine stays in your system for 4-6 hours so you may not want to drink this tea after lunch. Caffeine has been proven to enhance performance in athletes; hooray for that! If you’re a runner you probably don’t want to lose weight, so the benefit to you is that a caffeine boost will allow you to run faster and further. Pu.erh tea is quite strong so try one with added flavors you like. 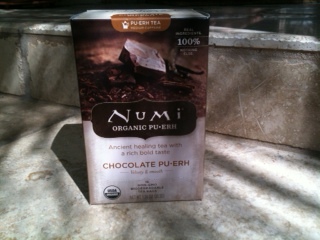 This organic chocolate pu-erh tea by Numi is a dark, rich tea mixed with vanilla, cinnamon and a few other ingredients. It’s a bit too strong as a hot tea unless you add more hot water and make it the size of a large coffee. I prefer this tea in a smoothie with a frozen banana and some raspberries. ← Green Coffee Beans – does it promote weight loss? You may be able to find it at your local supermarket. I bought it at Whole Foods. I’m going to try a different flavor next time. The chocolate is too strong.